Less than a week before the assassination of former Pakistani Prime Minister Benazir Bhutto, there had been another bloody assassination attempt in Pakistan – both could represent turning points in Pakistan’s ongoing struggle with Islamist violence. In northwest Pakistan a suicide bomber detonated his bomb inside a crowded mosque on Eid al-Adha (the Islamic Feast of Sacrifice which marks the end of the annual hajj.) The attack was an attempt to kill former Interior Minister Aftab Ahmed Khan Sherpao. Forty-eight people were killed and over 100 were wounded, including Sherpao's son and two grandnephews. Sherpao was unharmed. This was the second attempt on Sherpao’s life in eight months, the previous attempt at a political rally in nearby Charsadda, 28 were killed and Sherpao was slightly wounded. That Islamists would attack Sherpao is unsurprising. As Interior Minister he was a top security official and a key player in the Lal Masjid Mosque crackdown that has sparked the present high levels of violence. But for an Islamist to enter a mosque on a major holiday and murder innocent worshipers should be beyond the pale – even for radical Islamists. …a terrorist group’s attacks can cause revulsion among its actual or potential public constituency. This is a historically common strategic error and can cause the group to implode. Independent of the counterterrorist activity of a government, a terrorist group may choose a target that a wide range of its constituents consider illegitimate. The attacks on Bhutto, which have also killed many innocents, have undoubtedly deepened the revulsion amongst Pakistan’s public. But the attack on Sherpao and its attendant massacre of innocent worshipers should foster revulsion among the Islamist’s core base of support, the Pashtun tribes of the Northwest Frontier Province. Time and again, the Pakistani people have shown that they are not radical Islamists. The Islamist parties rarely poll even in the low double digits in national elections. Since taking power in the Northwest Frontier Province the Islamists have actually lost a great deal of support, when their rule proved little better than their secular predecessors. In the midst of the many tragedies faced by Pakistan there are real opportunities. If moderates in the Pakistani government and civil society can show real leadership (always a big if) against the Islamists they could find real support among Pakistan’s public and help turn Pakistan from a global security problem into the modern liberal Muslim democracy envisioned by its founders. Facts about Benazir Bhutto’s assassination are in short supply. Unfortunately that is unlikely to change. There is a long tradition of failure to investigate political murders in Pakistan. This cannot continue if Pakistan is to become a stable democratic state that serves its people and exists at peace with the world. The first step is that Musharraf invite the international community to advise in the investigation into Bhutto’s death. The investigation will be politically expensive – it may not reach Musharraf himself but it will reach deep into the civilian and military elites running Pakistan. Broad, tough international engagement is essential to seeing this forward – the stakes are very high. In courting Western support for her return to Pakistan, Bhutto promised that the International Atomic Energy Agency would receive access to A. Q. Khan, father of the Pakistani nuclear program and head of an international clandestine nuclear proliferation ring, who is currently under house arrest. It is inconceivable that Khan carried out his operations without substantial assistance from figures in Pakistan’s military and intelligence services. A thorough investigation might be a first step to countering the rot pervading Pakistani politics. But if the murderers and their backers can get away with this murder Pakistan’s downward spiral will only continue. A thorough investigation into a political murder would be a unique thing in Pakistani history. The October assassination attempt on Bhutto has not been thoroughly investigated – nor for that matter have the numerous assassination attempts on Musharraf. On October 16, 1951 Pakistan’s first Prime Minister was assassinated in Rawalpindi – in the same park where Bhutto was killed. Security forces immediately killed the assassin so little was gleaned about the plot. There remain unanswered questions about the deaths of Bhutto’s own brother Shahnawaz (poisoned in France in 1985) and Murtaza (who was shot by police in 1996.) There are ongoing suspicions that Benazir had a role in Murtaza’s death – suspicions held by other members of the Bhutto family. For that matter, Pakistan’s most famous artist Abdul Mohamed Ismail – better known as Gulgee - was killed at his home in Karachi recently and little has surfaced from the investigation. An FBI led investigation, or even its participation, may not be politically tenable. The United States is broadly distrusted in Pakistan, in part because of its close alliance with Musharraf. There are plenty of other nations with capable law enforcement agencies. Ideally many nations would participate – possibly using the Hariri assassination investigation as a model. The real problem will be getting the Pakistani government to sign on. Many top figures have much to fear. One important move that could swing broader support to an international investigation would be an expanded effort to build peaceful relations between Pakistan and India. The military is Pakistan’s most powerful institution and its core focus is seeking balance with India, which is an inherently much stronger power. This is why the recent news about US aid to Pakistan being diverted to conventional military capabilities targeted against India is no surprise. From the perspective of the Pakistani military, Islamists are at worst a nuisance and often an asset – India is the real existential threat. Final settlements in Kashmir are not likely, but frameworks that made a conventional war less likely and helped tamp down terrorist activity could go a long way to giving both sides the leeway to stand down, thus reducing Pakistani anxieties. India, on the whole, with its economic boom and global ambitions, has shown some willingness to reach accommodations with Pakistan. But having been abandoned by the U.S. before and watching the U.S.-Indian relationship grow this will be a hard sell to the Pakistanis. If the threat of national dismemberment (a very real one for Pakistan in a war against India) can be achieved then the moderates in the Pakistani military would be empowered against their extremist colleagues and a real house cleaning, particularly at the ISI could begin. Nothing less will do. Bhutto was a grand historical figure, talented but flawed. She died in the cause of a secular, moderate Pakistan. If a thorough investigation into her murder helps move Pakistan towards becoming a moderate Muslim democracy her death will not have been in vain. Although there are signs that Iran is tamping down violence in Iraq there are also worrying signs that Iran is ramping up for another round of international terror. Israeli intelligence has noted that Iranian Embassies are in Venezuela and Nicaragua have over 30 staffers each – far out of proportion to the scale of relations between these countries - and is expanding its diplomatic presence throughout the region. The Iranian presence in Nicaragua has become so extensive that Iran’s Ambassador in Managua actually gave an interview denying there were any Pasdaran in Nicaragua (a sure sign that they are in fact there.) There have also been a number of incidents in the United States with the Iranian mission at the UN. Every country uses its Embassy for a bit of espionage. But the Iranian tradition far exceeds the norm. Considering the long involvement of Iranian diplomats with terrorism, US military claims of Iranian diplomats engaged in inappropriate activities in Iraq should be given some credence. This Iranian network will be well supported by Hezbollah’s extensive international fundraising network. Besides the well-documented Hezbollah activities in the Tri-Border region drug dealing and counterfeiting cells with Hezbollah links have been found recently in Ecuador and Los Angeles. There are major centers of Lebanese Shia in Isle Margherita in Venezuela and in East Africa. Hezbollah works along family connections so where there are large numbers of Lebanese Shia, there is sure to be Hezbollah. While the respite in violence in Iraq is certainly welcome – and hopefully does represent a real policy shift – Iran’s capacity to strike worldwide remains and Western abilities to forecast Iranian intentions are notably weak. In 1992 four Iranian Kurdish leaders were assassinated at a Berlin restaurant called Mykonos. Ultimately the trial implicated Rafsanjani, Khamenei, foreign minister Velayati, and intelligence chief Ali Fallahian. The gunmen, again, were Hezbollah members. The coordinator for this attack, Kazem Darabi, was performing the cultural attaché function in Germany but did not have diplomatic immunity. He was tried and sentenced for his crime. Iran learned its lesson, Rabbani (coordinator of the AMIA attack) was granted diplomatic immunity in March 1994 (only four months before the attack) even though he had been in Argentina for 11 years. It is difficult to believe these operations were carried out without official approval from the top. All of these attacks (and there were others) furthered Iranian international objectives. After the Paris bombings the French released frozen Iranian funds, previously the French had strongly backed the Iraqis in the Iran-Iraq war. The Iranian Kurdish leaders murdered in the Mykonos affair were key opposition leaders. The 1992 Embassy bombing in Buenos Aires was to avenge Israel’s assassination of Hezbollah chief Abbas Musawi. This period of high profile Iranian terrorism ended in 1996 after the Khobar bombing. Richard Clarke, who was counter-terror chief at the NSC at the time, stated that the United States responded to Iran through covert action. This may have been outing Iranian agents around the world, which would have hurt their international terror infrastructure. The shift was tactical (perhaps like the change in the nuclear weaponization program). The regime remained involved in terrorism, just in different arenas and more often through proxies. Tehran is still Hezbollah’s lead sponsor, has provided training and logistical support to al-Qaeda (and a range of Sunni Islamists), and become the leading sponsor of Palestinian terror. Iran’s sponsorship and execution of the AMIA bombing in Buenos Aires, the largest massacre of Jews since the Holocaust, should be a reminder that this is a regime that uses terrorism as tool of diplomacy. AMIA, the communal offices of the Argentine Jewish community, was struck by a massive suicide truck bomb on July 18, 1994 – 85 were killed and over 200 injured. Iran and Hezbollah were suspected from the beginning. The Argentine investigation has had several false starts and has been mired in corruption, but in recent years has gotten on track. Last month Interpol voted overwhelmingly to issue a red letter calling for the arrest of five Iranians (along with Hezbollah’s external operations chief Imad Mughniyah) on the basis of the Argentine investigation. The publicly available report on the AMIA bombing offers tremendous insight into the Iranian regime’s modus operandi and worldview. Below are two network graphs (for more on the graphs and my research at the University of Maryland see the end of the post). 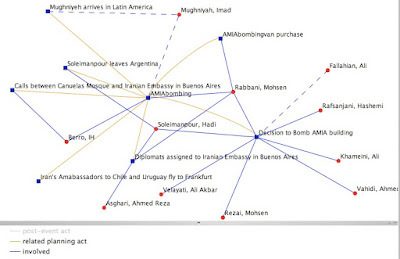 The first graph illustrates the web of interconnecting people and events that carried out the bombing. The second graph is the network linked to Mohsen Rabbani, the cultural affairs attaché at the Iranian Embassy who was the operations coordinator for the attack. In the first graph, red nodes represent people and blue square nodes are events. The blue lines (edges in network graph lingo) represent a person’s involvement in an event (dotted lines represent uncertainty as to whether a person participated in an event) while the yellow edges represent events that came before the central event (in this graph the AMIA bombing.) A few things become apparent, particularly the central role of Rabbani in pulling the attack together and the number of Iranian diplomats who left Latin America just prior to the attack. The web of events helps shed light on Rabbani’s network graph. 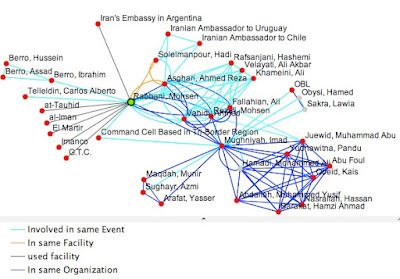 The yellow lines linked to Rabbani indicate the diplomats serving at Iran’s Embassy in Argentina. The dark blue edges linking Rabbani and several others, including Mughniyeh, represent the individuals named in the Interpol letter. In this graph the light blue lines are particularly important, they represent the people who were in an event together. The main tangle of blue that includes Rabbani and also then (and possibly future) Iranian President Rafsanjani, Supreme Leader Ali Khamenei, and then intelligence chief Ali Fallahian is the planning session in which the decision to bomb AMIA was made that reportedly took place nearly a year before the bombing on August 14, 1993 in the Iranian city of Mashad. Many of the light blue edges represent specific events linked to the bombing. Carlos Alberto Telleldin was the man unfortunate enough to sell Rabbani the used Renault Trafic van used in the bombing. Rabbani had been visiting rental agencies for some time looking for a similar vehicle. There was a web of calls between Rabbani and the Tri-Border region, where Mughniyeh had established coordinating cell. That was apparently where the suicide bomber, Ibrahim Hussein Berro was prepared for the task. The light blue edges between Berro and his brothers Assad and Hussein represent the phone calls he reportedly made to them in his final moments. The gray lines linked to Rabbani represent the web of mosques and business fronts he helped establish in Buenos Aires. Rabbani had been based there since 1983 and had built an extensive network, which also bombed the Israeli Embassy to Argentina in 1992. The overall story told by these graphs is of Iran using its Embassy as a base for a terror attack and working seamlessly with Hezbollah to carry out a complex operation on the far side of the world. The nuts and bolts of the operation were revealed by forensic evidence such as the paper trail telephone logs, travel records, and financial transactions, along with the serial number of the truck bomb. The weakest portion of the case deals with the planning meeting in Mashad and the involvement in Iran’s top leaders (it was based on testimony by a defector). Yet it is difficult to imagine a pair of major operations (remember the 1992 Embassy bombing in Argentina) being launched from the Buenos Aires Embassy with the regime’s top leaders being unaware. Rafsanjani and Khamenei are now the moderates who are checking Ahmadenijad's eschatological ambitions. The AMIA bombing was, in part, to avenge Israel’s abduction of Hezbollah officer Mustafa Dirani and Israel bombing in Lebanon. But it also had another angle – Argentina, under U.S. pressure, terminated arrangements to share nuclear technology with Iran. A regime prepared to flout all diplomatic norms to commit mass murder halfway around the world over its nuclear program is not likely to give it up so easily. Even if Iran has forsworn nuclear weapons, its links to international terrorism are deep and should weigh heavily in any assessment of its intentions. A brief description of my dayjob using the Semantic Web to research terrorism is here. While I will continue on this project, I also have a new position (still with the University of Maryland) with the Laboratory for Computational Cultural Dynamics which seeks “to develop the theory and algorithms required for tools to support decision making in cultural contexts.” That is, we hope to develop computer systems that will help model how different cultures act and react in different situations. When these models are developed they can be applied to a range of issues including counter-insurgency, development, crime prevention, and disaster relief. I also hope to do some posting on my work there soon. Lost in the good news that the Venezuelan people rejected President Hugo Chavez’s constitutional referendum is the story that federal police raided the main Jewish social club in Caracas the night before the polls opened for the referendum. This should be a reminder that although Chavez appeared conciliatory when he addressed his supporters there are some very dark tendencies in his regime. These aspects of the regime have not fully manifested themselves – beyond rhetorical chumminess with some of the world’s worst characters such as Iranian President “I want to erase Israel” Ahmadinejad, Cuba’s Castro, and Zimbabwe’s Mugabe. But as Chavez finds his domestic reforms stymied (one aspect of the defeated referendum was to allow the President to be re-elected indefinitely) and his economy implodes (inflation is on the upswing and government controlled pricing has led to food shortages) naked violence and repression may appear openly with tragic consequences for Venezuela and perhaps beyond. Two things must be made absolutely clear. First, violence, repression and terrorism often start by targeting Jews – but they inevitably move beyond the initial victims. Second, this raid, ostensibly searching for weapons and explosives, was not an isolated incident – it is part of a pattern of anti-Semitic behavior by the Chavez regime. When a Jew is attacked for being such, we enter a zone of total and absolute risk for the free thinking and existence of all, Jews and non Jews alike. Do not believe the official apologies, they are part of the same set up. In his 2005 Christmas Eve address, spoke of “…the descendents of the same ones that crucified Christ, the descendents of the same ones that kicked Bolivar out of here and also crucified him in their own way over there in Santa Marta, in Colombia. A minority has taken possession all of the wealth of the world . . . "
The anti-Semitism of the chavismo is no affectation; it is core to their worldview. One of Chavez’s mentors was a notorious Argentine anti-Semitic and Holocaust denying social scientist, the late Norberto Ceresole (thanks to another first-rate Venezuelan blog, The Devil’s Excrement, for this background). So far, as authoritarian demagogues go, Chavez has been relatively mild. Swag and swagger have fueled his rise on the world stage. But the strain of ancient evil running through the chavismo is a worrying sign that something darker lies beneath the bluster.